This novel is written in poetry, and from the perspective of two girls. The one on the left of the cover (which cover I really like a lot) is Wren Abbott. On the right, Darra Monson. The premise is this: Darra's father steals a car. What he doesn't know, is that Wren is in it. Accidental kidnapping. Things get sorted out, but both girls are still affected by the kidnapping when, years later, they meet by chance at a summer camp. Dah! It was so cool! It was the best kind of suspense novel: the kind in which your imagination is running wild. The way that Helen Frost crafts the story allows the reader to have an experience that is tense and riveting, but not frightening, no matter the age. People, this is good writing. And you may think, "could I ever give a book about kidnapping to a/my child?" well I would recommend this one. Okay, so I read it -- it reads very quickly, 142 pages and stanza breaks aplenty -- and then I read the author's Notes on Form and I was amazed all over again. Because Helen Frost has hidden another poem within the poems of the book, (sort of a reverse acrostic? she invented the form herself) where some of the last words in one set of poems is another poem. How did she DO that? This is craft. So, yeah, I was very impressed by it. It goes on sale May 10, 2011 (I was given a proof to review). I hope you read it, then we can talk about how cool it is, okay? 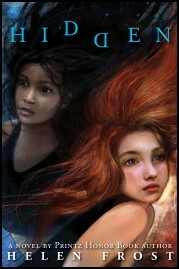 previously reviewed: Diamond Willow by Helen Frost, Cybils Middle Grade Fiction Finalist 2008. This sounds quite intriguing, Alysa! I'm not much of a fiction reader...and even less of a juvenile fiction reader (though my husband is always trying to reform me), but I think I will have to read this when it comes out. Thanks for sharing! I was able to request a copy of "Hidden" from another library -- it's on its way to my local library as we speak! I was able to request a copy of "Hidden" from another library -- it's on its way to my local library as we speak. Thanks for reminding me about it!